The town of Deception Bay lies 30km north of Brisbane in the south-eastern corner of the bay of the same name which separates the Redcliffe Peninsula and Bribie Island, hence it is a popular launching site for fishing in Moreton and Deception Bay waters. Extensive walkways and cycle paths follow the foreshores offering views and stimulating sea breezes. 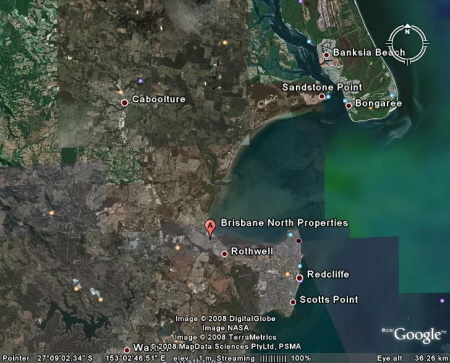 Deception Bay, Rothwell, and Mango Hill areas have had unprecedented growth over the past 2 to 3 years and are wonderful suburbs to live in regardless of whether you have a growing family, starting a family, wanting to get into the market or you are looking to retire and live in peace near the water. There are an abundance of schools (both state and private) in the area and sporting and recreational facilities. For the golfers there is a Driving Range at Deception Bay and the brand new golf club situated at North Lakes. Deception Bay is centrally located - only 10 minutes to the Redcliffe Peninsula and a 40 minute drive either way - south to the Brisbane CBD or north to Caloundra, the gateway to the Sunshine Coast.